To improve upon health care & welfare of the residents of dwarka, on Sunday 20th jan’13, SDKS organised free eye/dental check-up & also talk on the awareness of organ donation, in the community hall of Shaman Apartments, plot-9, sector-22, Dwarka. A large number of people attended the function. Besides awareness about organ donation, participants also stand benifitted by the check-up carried by the professional doctors. Free eye check-up of 103 people was carried by the eminent doctors from Sharp Sight Cenre (group of eye hospitals). Dental check-up done in person by Dr. Mohinder Yadav & Dr. Garima Yadav of Shri Balaji Dental and Orthodontic Centre. 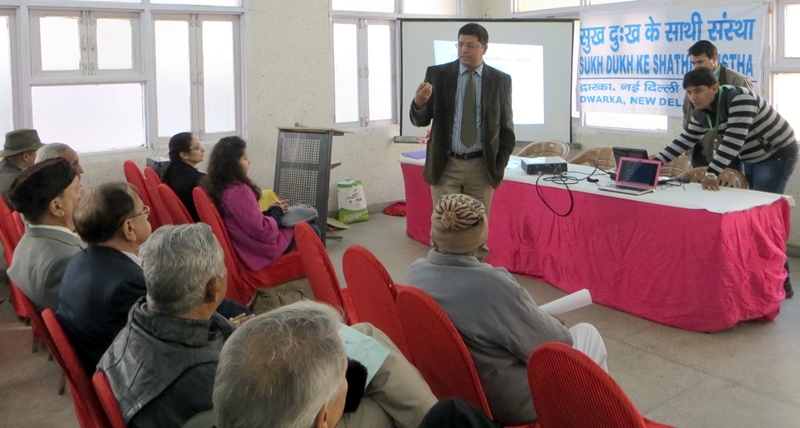 Dr. Sameer Sood, MD Sharp Sight Centre, gave in detail the causes/symptoms & treatment available for eye care. Dr. Yadav also briefed the house about the dental care/ treatment. ‘Volunteers for a Better India’ had also joined the gathering for display of unity in undertaking social work in various fields with an appeal to spare/give at least one hour for building better india. Mr. Vijay Shanker Singh, President of SDKS had welcomed all the specialists & the visitors/members of sanstha. He also commended the efforts made by Shri Khanna, Mathur, Jindal, Mann, Kapoor & Col (retd) Choudhary in organising the function. Mr. Kapoor, general secretary, gave vote of thanks to the participants, all the support staff of Shaman Apartment & their management committee through Mr. Upadhaya, president having made available their community hall for the purpose.